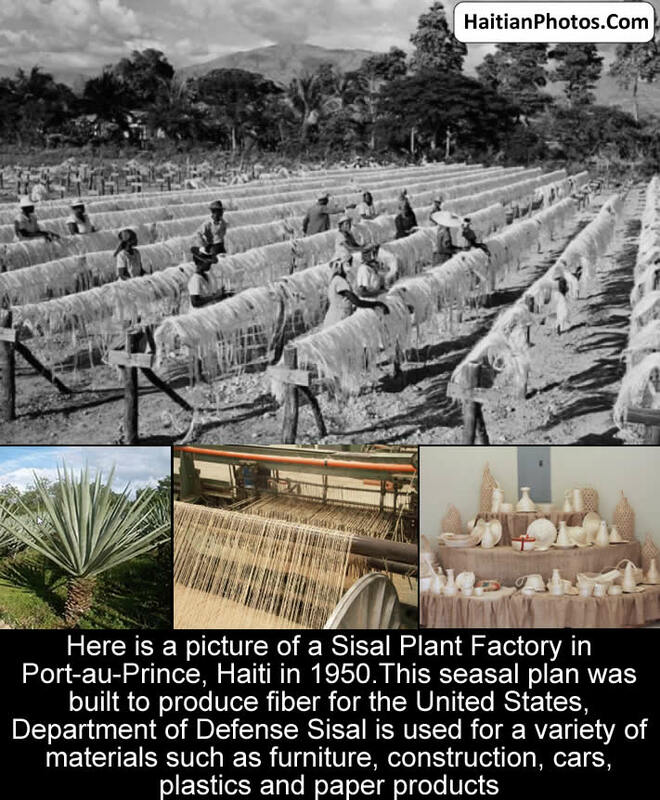 Here is a picture of a Sisal Plant Factory in Port-au-Prince, Haiti in 1950.This sisal plan was built to produce fiber for the United States, Department of Defense Sisal is used for a variety of materials such as furniture, construction, cars, plastics and paper products. Sisal is a stiffer fiber stripped from the leaves of the Mexican agave plant which is spun into a yarn-like material. The sisal fiber is traditionally used for rope and twine, but has many other uses like paper, cloth, footwear, hats, bags, carpets, and dart boards. Its strongest natural fibers make it incredibly durable. Sisal rugs are the best fit for high-traffic areas in the home because of its strength, durability, ability to stretch, affinity for certain dyestuffs, and resistance to deterioration in saltwater in places like hallways and entryways. Sisal is also used in low-cost and specialty paper, mattresses, wire rope cores, filters, buffing cloth, geotextiles carpets, handicrafts, and Macramé. Sisal's natural creamy white hue can be dyed any color to suit your interior design scheme. The fibers from the leaves can be used in their coarse, raw state which is more inflexible or can be blended with other fibers, such as wool, to produce a softer material. Agave Sisalana is a succulent plant closely related to the plant which brings us tequila. Since sisal is an agave, it can be distilled to make a tequila-like liquor. A sweetener is often extracted from its agave nectar (also called agave syrup) and used as an alternative to sugar in cooking. It grows in dry, desert climates such as the plains of Mexico and other parts of the New World. Dedicated sisal farms have been established, especially in Africa and Brazil. Sisal was used by the Aztecs and the Mayans to make crude fabrics and paper. The plant is quite hardy and can grow year round in hot climates and even in arid or dry regions that are typically unsuitable for other crops. Its growth depends on the level of rainfall, the altitude, and the location. Its production cycle can be up to 12 years during which it can produce up to a total of 180 to 240 leaves for its growth and crop for this fiber can grow up to four tonnes per hectare. It can grow to upwards of 15 feet in height and can have numerous plants and baby plants linked with it. Sisal has been considered as an environmentally friendly strengthening agent to replace asbestos and fibreglass in composite materials in various uses including the automobile industry. Haiti is one of the poorest countries in the Western Hemisphere where only 11.3% of the land is well suited for agriculture, where 14% people are unemployed and about 60% people live below the poverty line, the production of Sisal can play an important role in its economy. It could be a good means to generate income and bring the unemployed out of frustration. Here is a picture of an industry that was at one time the life line of Haiti. At the turn of the 19th century,Dauphin Plantation was the largest employer in Haiti, providing jobs to over two thousands people. Many people still remember today how things were in the region when the company was in existance. The economy of Caracol was booming. Most of the job involved the pressing of Sisal Plants for the production of fiber ropes and other products.